Goddamn. 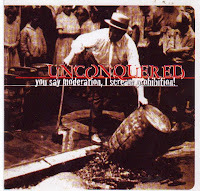 One of the heaviest, most brutal mid 90s bands that's for sure, Unconquered were not your typical West Coast band of that time. Whereas the likes of Mean Season, Outspoken and Unbroken, were heavy, they were far more intricate, even graceful, thus none of them could match the sheer weight of Unconquered who chose to forgo any melodic meanderings. This was their debut (or they may have had some 7 inches before…I think not), and was released on xLifesentencex and like so many of that label's early releases, it has become a long lost treasure, that time (as well as the label) has not been kind to. The former due to that Unconquered are not openly acknowledged as a band of note from the 90s, in fact, I imagine that many would cast them off as a bad Earth Crisis clone (sheer nonsense). Obviously xLifesentencex didn't say much shelf life in this record and thus let it lapse into out of print obscurity, meaning for those who want it, you have to hunt. They would go on to release two more records, a full length on Lifeforce (the supremely heavy 'Wall Of Time,') and Sober Mind ('The Program,') before disbanding. The singer Jason went on to form www.myspace.com/xxxforevertruexxx, who seem to have entered into hibernation, there has been nothing from that band for months. In regards to this record, you'll have to hit http://www.ebay.com/for it. we gave away about 200 Unconquered discs with orders over the last year in our 'free campaign'. great band, did one euro tour a couple years ago. There was a 7" release before this. I released the Uncoquered/Birthright split in 1995 on Words Of War Records. A year or so before the released anything with any other labels. UNCONQUERED have a Euro tour with SUNRISE (Poland) in 2001 (tour was named "Lashing Truth Campaign" if I remeber well).